Whilst they aren’t ‘Stone Henge’, the small town of Avebury is home to some big, old rocks that are possibly older than the more well known site and made for a good destination on our way back to London from Bath. A massive ditch, 21 metres wide and 11 high, encirlces the town that is built on the historic site of the stone circles (the wall of the ditch can be seen in the background of the above photo). Most of the stones where pulled down and chopped up for use in buildings and stone walls, others were buried to make more space in the fields. Originally there were almost 100 stones, some that weighed over 40 tonnes, only 27 have been re-errected. While I marvelled at the size of the rocks and how they were originally moved here and put in place (the larger ones continue underground 3 metres deep or more), Gemma and Kimberley seemed happier to take photos of the sheep. 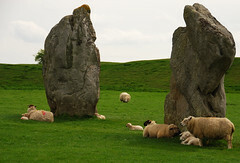 As you can see sheep graze peacefully amoungst the henge disturbed only by a passing tourist. A local souvenir/antique shop provided the most enjoyment. The owner, who had lived in Avebury all his life, was somewhat of a history buff and able to inform us of the history of the town and henge. For his trouble we bought an antique stone medicine jar that will become a vase in our home (when we find one). We also checked out another old Church in the town that originated over 1000 years ago, the current building being completed in the 16th centuary.